Grade five and six students in the study group work on a Language Awareness activity. Here, they are applying what they know about a particular language and languages in general to make sense of a conversation about weather. The lesson involved learning weather vocabulary and negation syntax in Spanish, Haitian Creole, Inuktitut (a native language of Northern Canada) and Malagasy (a language of Madagascar). With 17.9% of the US population speaking a language other than English at home (US Census Bureau, 2005) and 17.6% of the Canadian population declaring a mother tongue other than French or English (Statistics Canada, 2004), urban schools on both sides of the border are increasingly characterized by linguistic diversity. In recent years, Canadian educators have drawn attention to children of diverse origins in immersion classrooms (Dagenais, 2003). 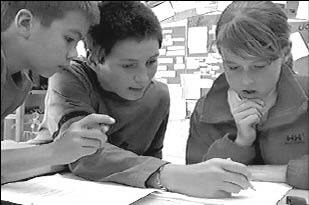 While studies have provided abundant evidence of the positive benefits of French Immersion for English-speaking students (Lapkin, Swain & Shapson, 1990), there is relatively little data on the progress of learners of diverse origins in immersion (Taylor, 1992). In response to these issues I undertook ethnographic research to gather information on multilingual immersion students’ language practices at home and school. Children’s conversations at home were audiotaped, their classroom interactions were videotaped, parents kept written records of literacy practices at home and we conducted open-ended interviews with the children, their parents and teachers. At home, the families of my study group regularly alternated between languages. For example, in a family of South Asian origin, the grandparents spoke only Punjabi with all members of the family, the parents alternated between Hindi (the mother’s heritage language) and English in their conversations together, and she spoke a combination of Hindi and English with the children whereas the father spoke a combination of Punjabi and English with them. The children spoke to each other mainly in English but eventually used some French during homework activities as the youngest child progressed through school. The multilingual children also engaged in a rich array of literacy practices at home. For instance, Vanessa wrote letters in Spanish to relatives, did her homework in French and English, read recipes in Spanish when helping her mother cook and read Spanish language magazines that were at home. In addition, she read novels for pleasure in English and in French for homework, watched television in English and occasionally in French, watched videos in Spanish and English. She listened to the local radio station in English and sometimes listened to cassettes or CDs in Spanish. Thus, Vanessa and her multilingual peers drew on each language for particular purposes and literacy tasks according to their needs and communication partners. Interview excerpts and narrative interpretations of observational data were shared with policy makers and educators to counter the myth that bilingual education is too taxing for children of immigrant families. Unlike their unilingual counterparts, these children had already learned at a young age to juggle the communicative demands of a complex multilingual context. Moreover, their parents did not view the introduction of new languages as a threat to family languages; rather, they actively sought out opportunities for their children to learn new languages. They enrolled their children in immersion to learn French and English while adopting a range of strategies to maintain the family language at home, such as registering their children in community-based language classes on evenings or weekends, providing individual tutoring, participating in religious activities in the family language or making regular trips to the parents’ country of origin. One couple gave the following rationale for choosing immersion education. Mike: We told ourselves that she has to learn three or four languages. Not just one. Most kids here just know one language. They are very fluent in English. They are very good in English, right, but that’s all they know. Lak: And we thought that it would be great if she knows other languages besides English and Punjabi. Because in Singapore, she probably would be speaking Chinese, Malay, and Punjabi. So, we thought that if there are four languages that she could pick up there, what is it to have another language here? Clearly, these parents wanted to position their children favorably with respect to monolinguals and bilinguals locally, nationally and internationally. Aware of forces of globalization, they adopted a transnational perspective to invest in a language program that would help attain this objective. Contrary to the multilingual practices we documented at home, observations at school revealed that a monolingual norm prevailed in classrooms focusing on the language of instruction, either French or English. Nevertheless, over two years of observations, we documented a few exciting occasions when teachers recognized children’s multilingualism, as illustrated in the case below. The children were later asked to read their text to the class. When Chaska did so, her classmates asked her to say something in Spanish. Chaska: Spanish? ¡Hola! ¿Cómo estás ? Chaska: Hi! How are you? Chaska: Sabes que - know what?. . . If you say gato in Spanish. . . And in French it’s like gateau (cake). Other child: Gato. Chaton (kitten). Chaska: If you say Yo quiero comer un gato. . . . They will think you want to eat a cat. Chaska: Yes. . . . Given the opportunity to display her knowledge of three languages, Chaska shared a humorous observation about similarities and differences in the Spanish word gato and the French gateau. Moreover, her teacher acknowledged her experience by repeating her Spanish greeting. Such observations led me to explore approaches for recognizing language diversity such as Language Awareness. Language Awareness originated in Britain with the work of Hawkins (1984) and his team. Recently, this approach has been developed extensively in francophone Europe and has drawn the attention of education policy makers in the European Union (Castellotti & Moore, 2002). Language Awareness has students attend systematically to language diversity and compare the patterns of their own languages as well as those of their classmates, communities and the media. Immigrant children’s knowledge of other languages is used as a teaching resource to inform all students, so that languages that once seemed distant become more familiar and accessible. European research has shown that Language Awareness operates as a powerful tool for developing knowledge of language patterns and promoting positive attitudes to speakers of other languages (Candelier, 2003). In an ongoing teacher-researcher project with colleagues in Montreal, Quebec, my research partners and I adapted Language Awareness activities developed for francophone classrooms in Europe and Montreal to the language level and the cultural context of a grade 5/6 French Immersion classroom in Vancouver, British Columbia1. Activities addressed themes such as families of languages, borrowings between languages, origins of names for locations, and the evolution of alphabets and scripts. Our analysis of classroom videotapes and interviews of children suggests that multilingual students were repositioned in social interactions during Language Awareness activities. As they shared their language resources with their teacher and peers, their knowledge was no longer marginalized but became central to discussions about language diversity. Moreover, when exposed to oral or written texts in diverse languages beyond the language of instruction, students drew on their collective knowledge, including the expertise of multilingual peers. The children readily pooled their resources to make links between the languages that were known and unknown to them. 1 Françoise Armand and Diane Dagenais received funding for this research from the Metropolis Project, the Social Sciences and Humanities Research Council of Canada and Canadian Heritage.